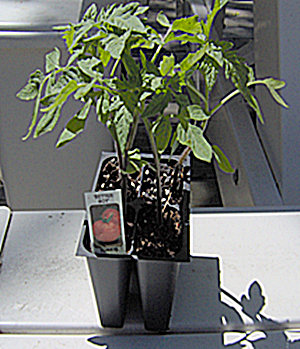 Buy Big or Buy Small: Does Pot Size and Quantity Matter with Tomatoes? | Horticulture Talk! That is about the same as what I told her, but she said I was nuts. If I remember correctly in past years, my plants are always healthy and full of fruits while hers always get blight and disease and die before the fruits ripen. Having a larger plant makes the plant’s whole growth pattern change. While going through shock from transplanting or not as much fertilizer or ?? ?, the plant is more susceptible to disease. I’m not surprised to hear about the early death of the plants. we bought a larger tomato plant than what I usually purchase, suffered no transplant shock and the flowers on the plant were small fruits in 10 days, and now after another 5 or 6 days I have a total of 5 tomatoes on my plant. And this is a long season beefsteak heirloom specie.